Garage door maintenance may seem like a hassle, but it can be downright necessary, as it can help you prolong the lifespan of your door. No homeowner is exempt from it, provided they want their systems to live up to their full potential. There are service providers (such as our own...) that can provide you with routine maintenance appointments that can prevent a lot of potential issues. If you do end up finding yourself experiencing a problem, there are some things you can do. It is easy to tell that something may be wrong with your door if it's getting stuck repeatedly, or if more effort is needed just to open or close it. Either way, the source of the problem could be one or more of the hardware parts. You can check the track to see if its become bent or blocked by debris. Making sure it is clean will help your door perform more smoothly. 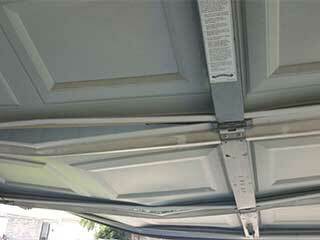 As durable as garage doors can be, they are not immune to nature's wrath. On extremely cold winter days, the door can actually get frozen shut and stick to the ground. This is usually due to some watery resudies that have seeped and pooled under the panels. To deal with this problem, it is important to thaw out the ice before you try to force your door open. Even a blow dryer could potentially help you here, or various de-icing products. Make sure to wipe away the melting ice afterward to prevent it from refreezing later on. Also, you may want to check the bottom seal to see if it's got any holes that have allowed rain to come through. While the root of this issue is also the hardware parts, the most likely culprits here are the springs and rollers. You can check them to see if they developed any damages, and get an expert to replace them if their condition proves to be bad. You can also lubricate the springs and the rollers (if they are not nylon coated) as that oftentimes tends to solve the issue. There are a lot of different issues that your automatic overhead door system could suffer from, aside from some minor maintenance tasks that you can perform, any real issue should be left to the experts. Contact our team at Garage Door Repair Libertyville when you need help.